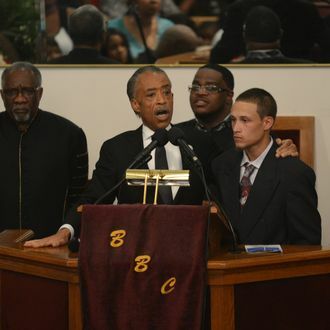 Ramsey Orta at Eric Garner's funeral. Ramsey Orta, the 22-year-old Staten Island man who filmed the infamous cell phone footage of officer Daniel Pantaleo putting Eric Garner in a fatal chokehold, is now in police custody. The Staten Island Advance reports that Orta was arrested on Saturday night on Staten Island’s Central Avenue, an area that is known for drug dealing, according to the NYPD. Narcotics officers say that they watched Orta and a 17-year-old, Alba Lekaj, leave a hotel together, and that he placed what turned out to be an unloaded .25 caliber handgun in the girl’s waistband. The gun was reported stolen in Michigan in 2007. Orta was charged with two counts of weapon possession (he has a prior conviction that bars him from having a firearm), while Lekaj ended up with one weapon charge and a charge for having a small amount of pot. According to the New York Times, Orta was brought to Richmond University Medical Center shortly after arriving at the precinct house due to asthma and a possible panic attack. Al Sharpton, who introduced Orta at Garner’s funeral last month, had a different interpretation of the situation. On Sunday, he again urged the Justice Department to begin investigating Garner’s death as a civil-rights violation, noting that using Orta as a witness in that case while also prosecuting him for a different crime would create a “conflict of interest” for the Staten Island district attorney’s office. “Let the federal government handle it … so that there is no question about the objectivity of the investigation,” Sharpton said. Orta appeared in court on Monday and pleaded not guilty to both of his charges. His mother, Emily Mercado, told CBS 2 that the police have been watching her son since he recorded a half dozen officers piling onto Garner. “They’ve been following him,” she said. “They’ve been sitting in front of my house. They put spot lights in my window.” Orta’s wife, Chrissie Ortiz, referred to her husband’s arrest as “payback” and suggested it was a setup, saying, “The day after they declare [Garner’s death] a homicide, you find someone next to him with a gun, and you saw him pass it off? Out in public when he knows he’s in the public spotlight? It makes no sense.” Meanwhile, the NYPD claims that the officers who arrested Orta didn’t know who he was until he accused them of targeting him.